Author/s : Special Nutrients Inc. 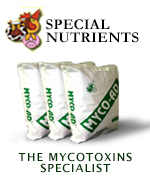 Note: The combination of two or more mycotoxins, even at LOW levels can be more toxic than one toxin at a high level and might NOT show the same symptoms as one mycotoxin. * Growth and feed conversion reduction. * Feed consumption reduction, hardened hair, hypertony. * Coagulation apathy, depression, anorexia. * Acute hepatitis, and mortality in 3 to 10 days. * No conception effect, normal slow growing suckling pigs because of aflatoxin in the milk. * Moderate renal lesions. reduction in weight gain. * Reduced feed consumption, oral and dermal irritation. * Full rejection and vomiting. * Persistency of anestra lutea body.